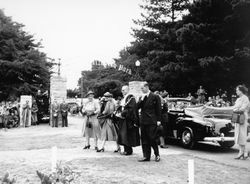 A park and entrance gates erected to commemorate the visit of Queen Elizabeth II to Mount Gambier in February 1954. Plans for entrance gates to the camping ground and lakes prepared by the Municipal Engineer (Mr. A. R. Griffiths) provide for an archway over the drive bearing the name "Queen Elizabeth Park." Mr. Griffiths showed the plan to the Town Council at its special Budget session, when £300 was placed on the Budget for the gates. 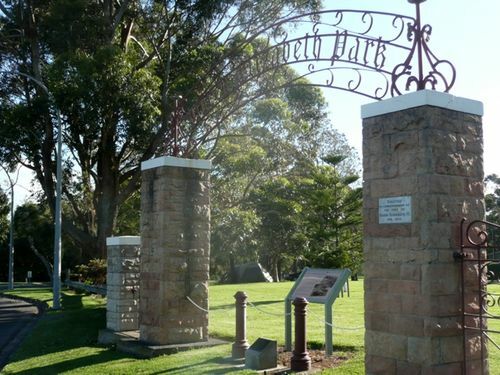 Mr. Griffiths said the two main pillars would be built of dressed pink dolomite, the two outer pillars of grey dolomite, the archway and two small footpath gates of steel. The main columns have electric light fittings. Members of the Council were impressed with the plans. Border Watch (Mount Gambier, SA), 6 October 1953. Erected in commemoration of the visit of Queen Elizabeth 11, Feb. 1954.